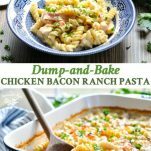 A 10-minute crowd-pleaser, this Dump-and-Bake Chicken Bacon Ranch Pasta is an easy dinner recipe for your busiest weeknights -- and you don't even have to boil the pasta! 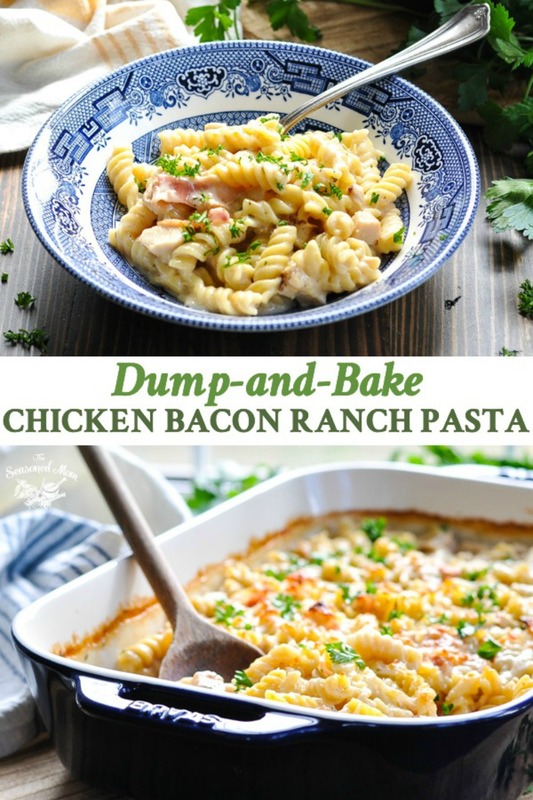 A 10-minute crowd-pleaser, this Dump-and-Bake Chicken Bacon Ranch Pasta is an easy dinner recipe for your busiest weeknights — and you don’t even have to boil the pasta! 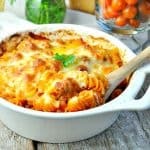 With practically no effort at all (and only a handful of very simple ingredients), you can serve your family a homemade baked pasta dinner that’s warm, cheesy, and oozing with creamy goodness. 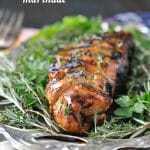 Add a fresh green salad or a spoonful of roasted broccoli and you’ve got a quick meal that the kids will actually eat! It’s perfect for those days when you just don’t have the time or energy to slave over the stove. Heck, you don’t even have to cook the pasta before it goes into the oven! 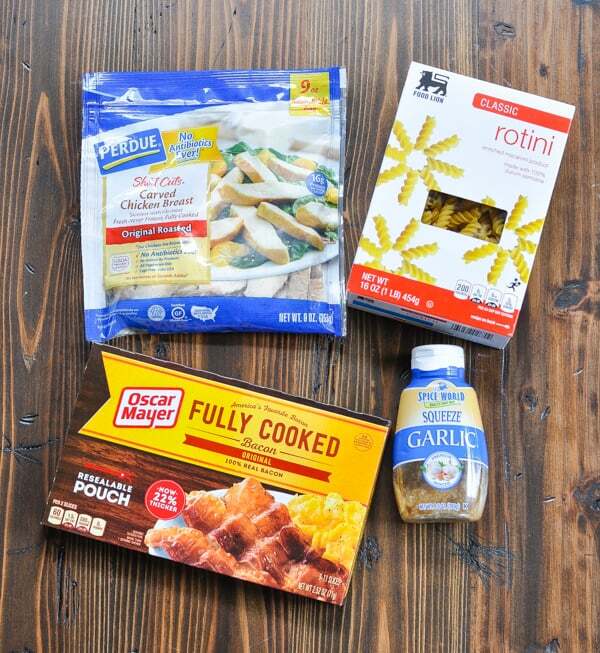 First, you’ll need Alfredo sauce, chicken broth and a packet of dry Hidden Valley Ranch seasoning mix. 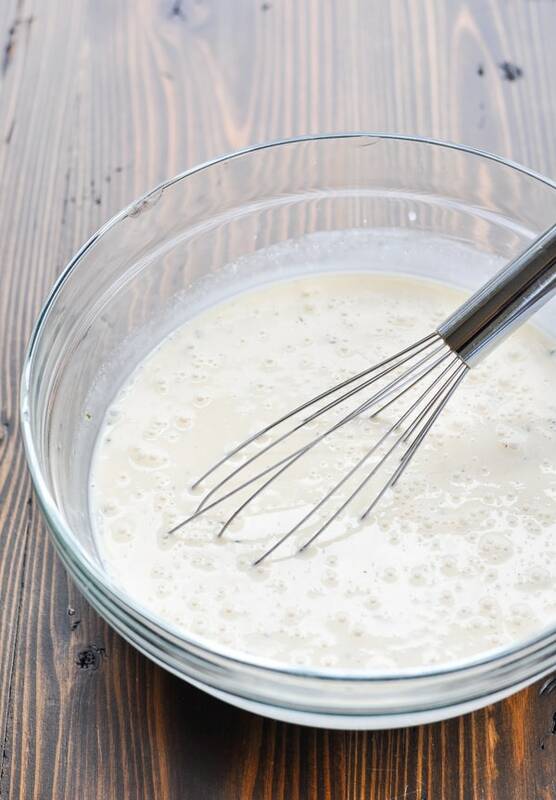 Whisk together these three ingredients in your baking dish or in a separate bowl until smooth. Minced garlic (mince your own fresh garlic or buy a bottle of minced fresh garlic for a shortcut). 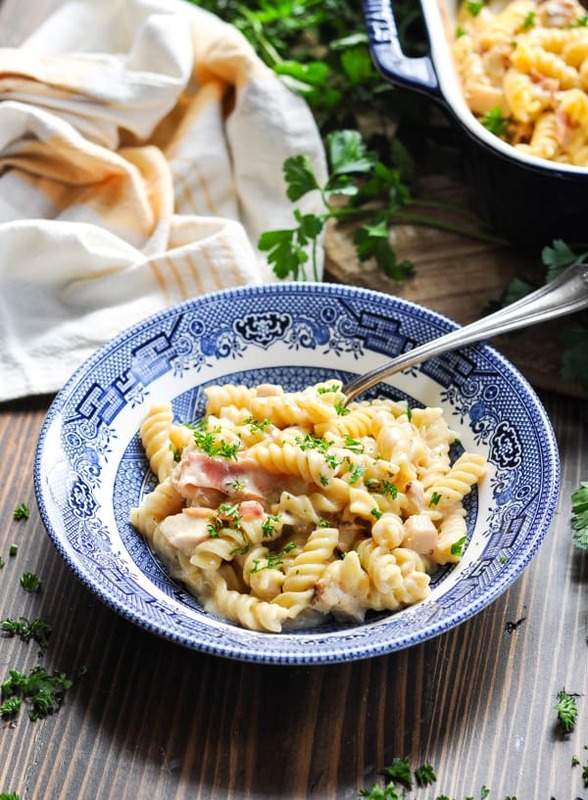 Toss the chicken, bacon, garlic and uncooked pasta with the creamy sauce and your job is practically DONE! Bake the casserole, covered, in a 375 degree F oven for 35 minutes. Then remove the cover, give the pasta a stir, and sprinkle the top with shredded cheese. Pop the dish back in the oven (uncovered) for about 5-10 more minutes, or until the pasta is tender and the cheese is melted. I like to allow the casserole to rest for about 5 minutes, which gives the sauce a chance to thicken even more. 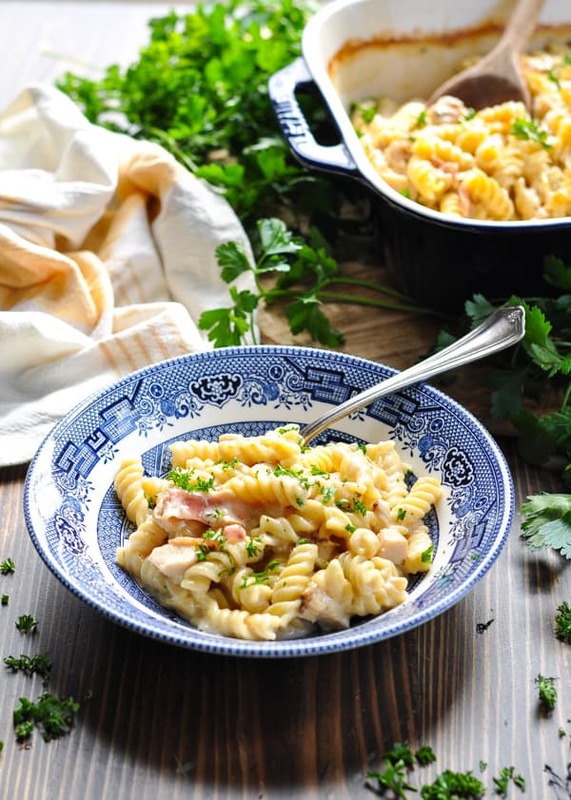 Garnish the pasta with fresh parsley and serve! 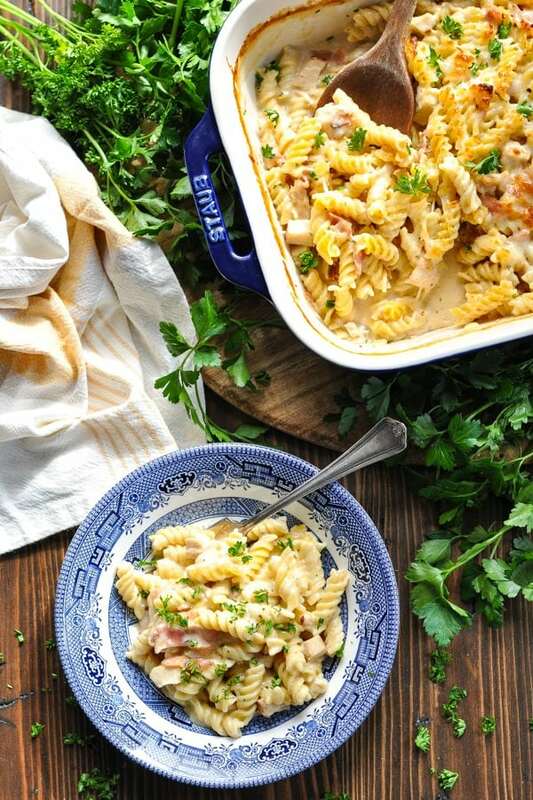 Can Chicken Bacon Ranch Pasta be made ahead? Yes, you can assemble this casserole up to 8 hours in advance. Keep it covered in the refrigerator until you’re ready to bake. If you’re baking it from the refrigerator, allow the dish to sit on the counter and come to room temperature (or add a few extra minutes to the suggested baking time). 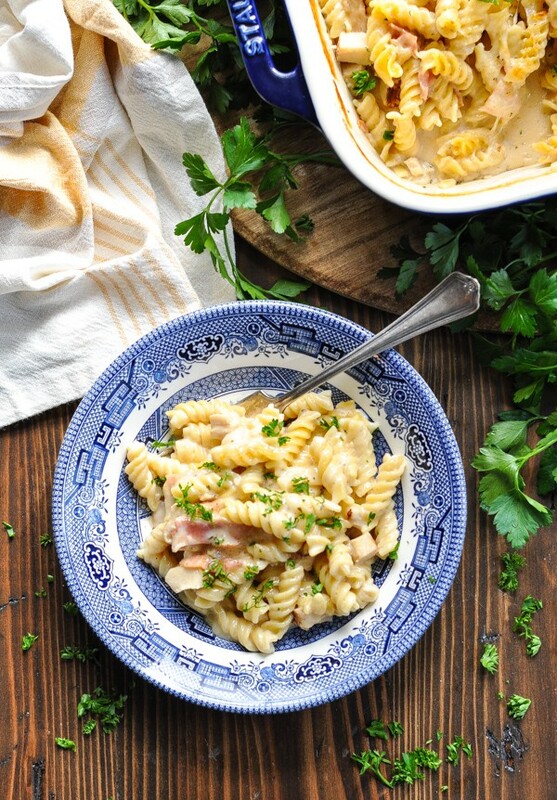 Can I freeze Chicken Bacon Ranch Pasta? I do not suggest freezing this casserole before or after baking. I worry that the texture of the pasta will be mushy when thawed, and there’s a chance that the creamy sauce will break. Yes! If you have leftovers, you can reheat them (covered) in a 300 degree F oven just until warmed through. 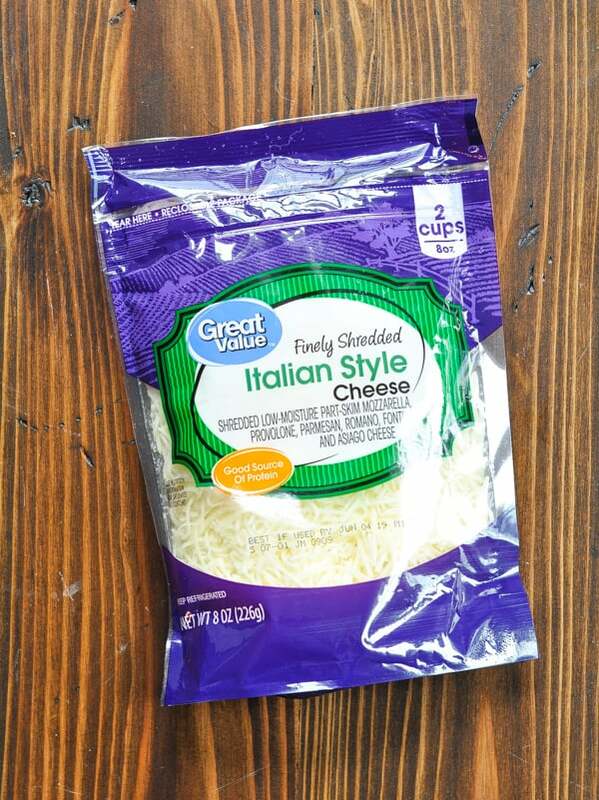 You can also reheat individual bowls of pasta (covered) in the microwave in about 1 minute. If you don’t have rotini pasta, you can substitute with a similar short pasta that has a cooking time of 9-11 minutes called for on the box. 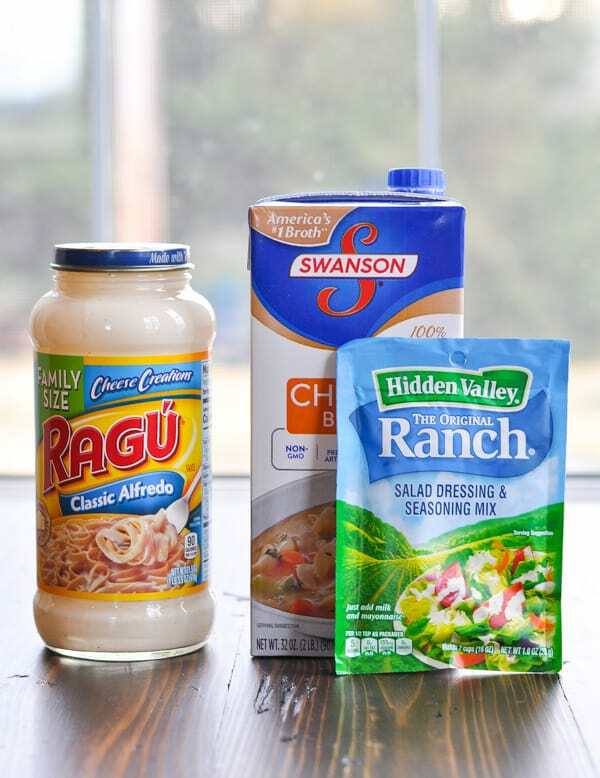 Make sure that you’re buying a large “family size” jar of Alfredo sauce, or purchase two regular-size jars. You need a total of 2.5 cups of Alfredo, so you could even make your own sauce from scratch if you prefer! 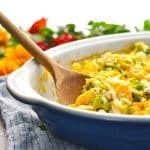 Stir some frozen peas into the casserole during the final few minutes of baking — just before adding the cheese (you don’t even need to thaw the peas first). 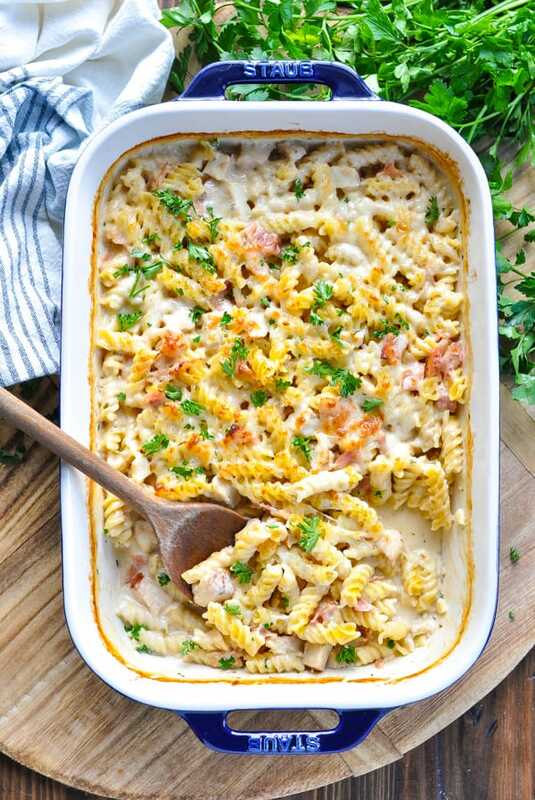 Make a Chicken Bacon Ranch Pasta with Spinach by stirring a few handfuls of fresh spinach into the dish during the final few minutes of baking (just before adding the cheese). The spinach will wilt quickly! 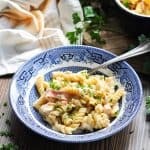 Prepare Chicken Bacon Ranch Broccoli Pasta by stirring steamed broccoli florets into the casserole during the final few minutes of baking (just before adding the cheese). Don’t have any cooked chicken on hand? 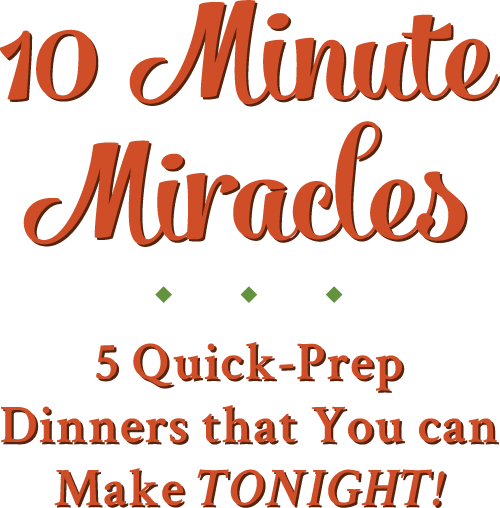 You can use diced, raw chicken breast instead! 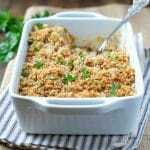 Stir the raw meat into the casserole dish at the beginning of the cooking time (just like you would for the cooked chicken). 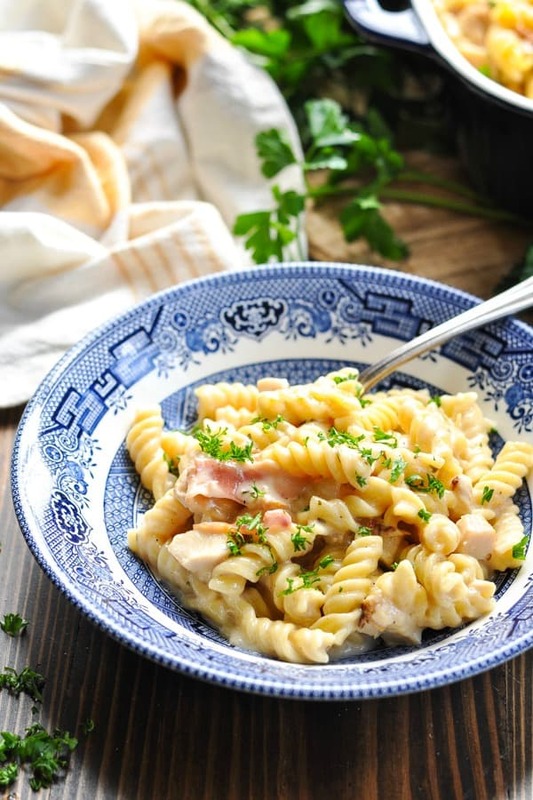 Just make sure that you dice the raw chicken into very small bite-sized pieces so that the meat is done cooking at the same time as the pasta. Preheat oven to 425 degrees F (220 degrees C). Spray a 9 x 13-inch baking dish with cooking spray. 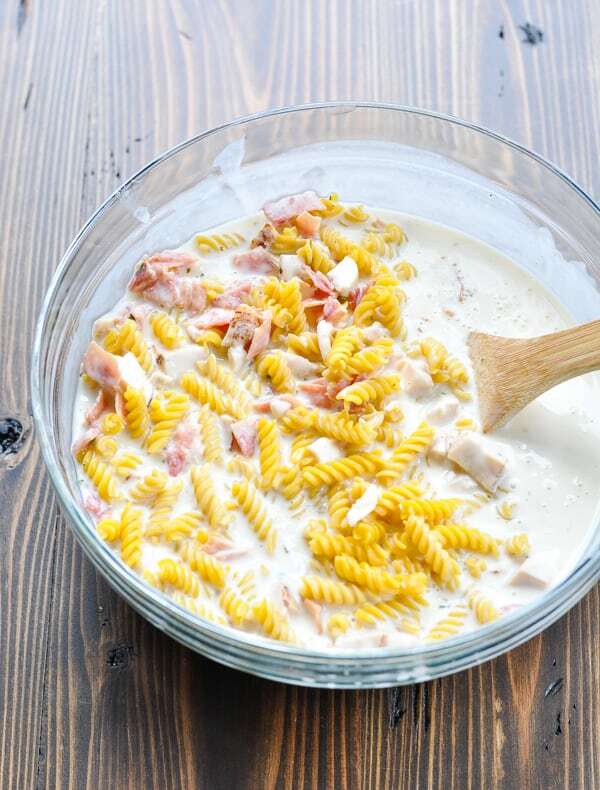 In the prepared baking dish (or in a separate bowl), whisk together Alfredo sauce, chicken broth and Ranch seasoning packet until completely combined. Stir in the uncooked pasta, chicken, bacon, and garlic. Cover the dish tightly with foil. Bake for 35 minutes. Uncover; stir. At this point, the pasta should be al dente (firm but just about finished cooking). There will still be plenty of liquid in the dish, but don’t worry – this will thicken as the dish continues to bake and cool. If the pasta is still too hard after 35 minutes, just cover the dish and return to the oven until pasta is al dente. Then move on to the next step. Sprinkle mozzarella over top. Bake, uncovered, for 5-10 more minutes (or until cheese is melted and pasta is tender). Allow to rest for about 5-10 minutes before serving (the sauce will continue to thicken as it cools). Garnish with grated Parmesan and fresh parsley, if desired.